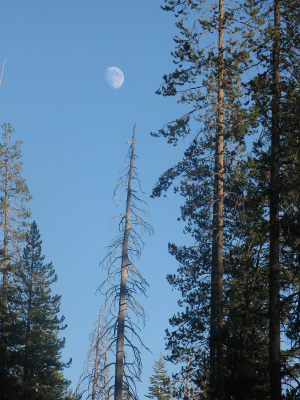 Every working day Forests Forever speaks directly to concerned Californians like yourself, making them aware of the latest threats to forests and marshaling their phone calls, emails, and individually written letters to targeted decision-makers. We reach thousands of citizens per year with our urgent message. Over this last year we exerted unremitting pressure in Sacramento against the underhanded Effectiveness Monitoring Committee. At this writing the fight continues. We deemphasized legislative lobbying, instead placing more of our resources into a potentially more fruitful organizing approach befitting the challenges of 2014— administrative, or executive-branch, advocacy. With it we pressed not for enactment of new laws but rather for making sure that laws already on the books (A.B. 1492 mostly) would be more effectively carried out. So far the experience has been a rewarding one, as our new advocate, respected forestry restorationist and rules expert Richard Gienger, has worked day and night to further our EMC-curbing, pro-pilot projects push. Internally, even as we ramped up our advocacy on a new tack, in 2014 we more than tripled our output of email action alerts (including to you, if we have your email address) compared to 2013. Our website (www.forestsforever.org) underwent a thorough redesign and upgrade, with much more frequent posts and adding 10 times more audio-video content. Effective street canvassing—an economical form of outreach and prospecting—was added to our arsenal of approaches to organizing, with excellent results. We continued to speak out against the outmoded practice of clearcutting. And in addition to generating letters and calls against a leading salvage logging scheme advanced in Congress, as well as against a bill to undercut the president’s ability to designate national monuments, we continued to press the state Air Resources Board to stop rewarding clearcutting projects with lucrative carbon credits in California’s new cap-and-trade market; clearcuts greatly add to carbon emissions.